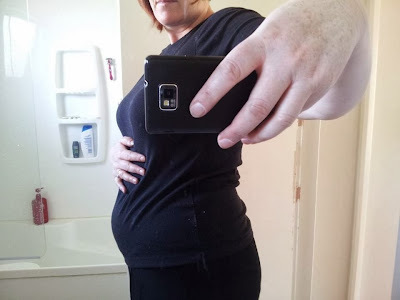 I'm not very skilled at taking selfie bump pics, but here I am at 16 weeks. At least it made me clean the mirror! This was taken for my friend Weza (whom most of you in blogland will know). I was trying to figure out if this was baby or flab. She says baby. I'm still on the fence. BUT, I have only put on 300grams in this whole pregnancy, so I am thinking possibly not flab. Morning sickness put paid to any weight gain. Although I never threw up, I was a very fussy/picky eater, never being able to decide what to eat. This week baby's bones are hardening. I am craving yoghurt, cheese, cheese and cheese, spinach, fish, and eggs. Aren't bodies just magical things the way they just know what to do? I am very aware of a transition taking place. I am totally struggling with it in some ways, and embracing it in other ways. In the first trimester, my motivation was totally lacking. Feeling sick and tired all the time will do that to a girl! Often, meals were easy and not always the best nutrition, housework was left, clothes remained unfolded in piles around the house, bed was unmade, dirty clothes in corners awaiting the washing machine. Hubby took on more around the house but with his final exams coming up, a lot of things were left undone. Work took a dive for me. I did the basics and no more. I feel like I really failed in my leadership roles, as I had less focus and drive than I used to. And I just felt, well, sort of uninterested. Where had my ambition gone? Now in the second trimester, I have a bit more energy, although still needing naps, and yet, my priorities have changed. I still lack ambition and professional drive, but find myself wanting to get unfinished projects done around the house. Sewing, knitting, making, creating, and painting all those pieces of furniture I have been meaning to revamp, seem to be in my immediate thoughts. And I will do them. This week. I can only surmise that something chemical is going on in my brain. My priorities have changed, the things I used to value have taken a back seat and I feel like everything has been put into slow motion. I keep thinking it will change back to 'normal' soon, but as I continue in this pregnancy, I start to wonder if there is a new 'normal' being shaped. One that includes room for a baby. So maybe this is all a good thing. Yes yes yes! this is all part of preparing you for the new normal, and it is weird and scary and uncomfortable and freaky and wonderful and exciting all at once... and when i think about it I get goosebumps and just want to weep with happiness for you!! eek. Look at that gorgeous bump! Every pregnancy is different! Just go with it. Your experience is your experience. The good and the "desperately need to sniff petrol" bad...yep...one of my weirder cravings! I am SO SO happy for you!! Congrats on that little baby! I am a creative, fun-loving 30-something woman, lover of Christ, wife, friend, and teacher, living in Christchurch New Zealand. Married to a gorgeous man who is studying to be a brilliant mathematician. Creative releases include cooking, art of all kinds, and making things. Forever on a journey.